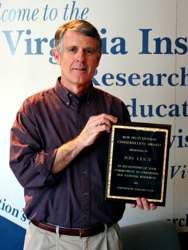 Mr. Jon Lucy of the Virginia Institute of Marine Science has received the Bob Hutchinson Conservation award from the Portsmouth Anglers Club for his continuing efforts to promote more effective management of Virginia's recreational fisheries. Lucy, a Marine Recreation Specialist in the Sea Grant Marine Advisory Program at VIMS, was recognized for his longstanding leadership with the state's game fish tagging program, which he coordinates in concert with Mr. Claude Bain, Director of the Virginia Saltwater Fishing Tournament. Lucy's work expands understanding of catch-and-release fishing as a management tool in marine sport fisheries, and includes studies of release-mortality issues in fish discarded by anglers. Working with both conventional and telemetry tagging projects, he also studies small- and large-scale movement patterns of important recreational species. The Virginia Game Fish Tagging Program, initiated in 1995, coordinates the tagging efforts of a dedicated group of trained recreational anglers who help gather new and updated information on seasonal movements and habitat preferences of marine fish targeted by Virginia's anglers. The program's database now includes more than 87,000 records of tag-released fish and approximately 8,400 recapture records. The program is primarily funded with revenues from Virginia's saltwater recreational fishing license. In response to the award, Lucy says "To give credit where credit is due, significant funding for much of my work has come from saltwater license revenues. So I think it's only fair to say that the award, while presented to me, really also recognizes the growing conservation ethic of our saltwater angling community." This is the fifth year the club has presented the award, which is named after Bob Hutchinson. Still looked to as a leader by Virginia's saltwater angling community, Hutchinson retired in 2001 after 37 years as outdoor editor of The Virginian-Pilot. The Portsmouth Anglers' Club was founded in 1965 and now has more than 300 members. The club has been the principal anglers' club in Portsmouth for several decades.